Have you managed to make a complete statement within this time? What were your main problems? Within 2 minutes? 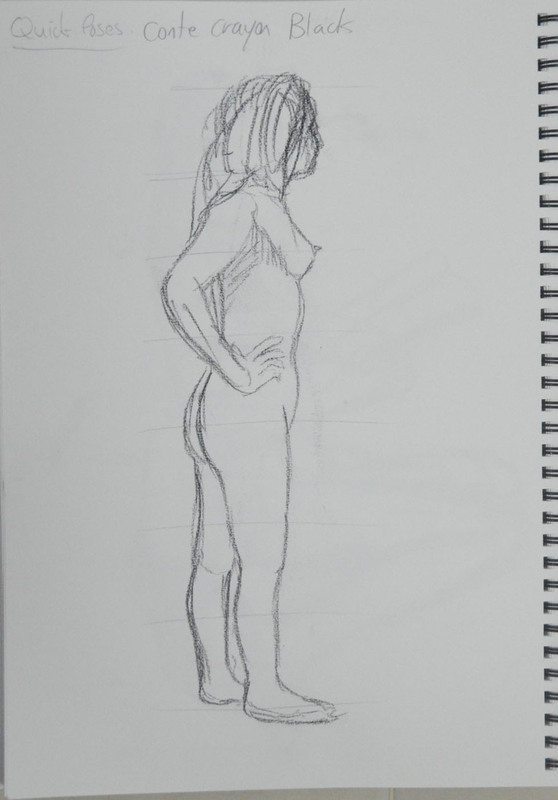 No, there is definitely a lot more time needed at this stage, however, with more practise drawing the human figure, two minutes could be enough to make a statement of a sort, more so with ten minutes. With one hour in ‘The Longer Pose‘ I do feel I managed to make a complete statement but the drawings did suffer with consistency. 1. I have this knack of drawing the bodies really well with flowing lines but then when I get to the head and face I tend to tighten up and give the subject Action Man/Thunderbirds’ like features. I don’t know how other people see the drawings but that’s what I see. 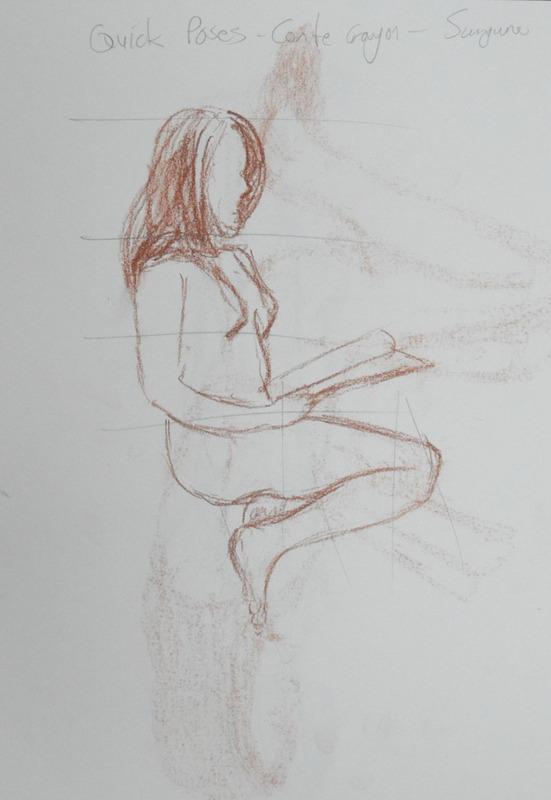 In the 2 minute life-drawing sketches In the ‘Quick Poses‘ exercise I would say about 50/50 I can see the original pose in what I captured on paper but then I would say that others probably wouldn’t get it. But then in ‘The Longer Pose’ exercise I would say ever I have managed to capture, in the pose, what draw me to it in the first place. Do the proportions look right? If now how will you try to improve this? 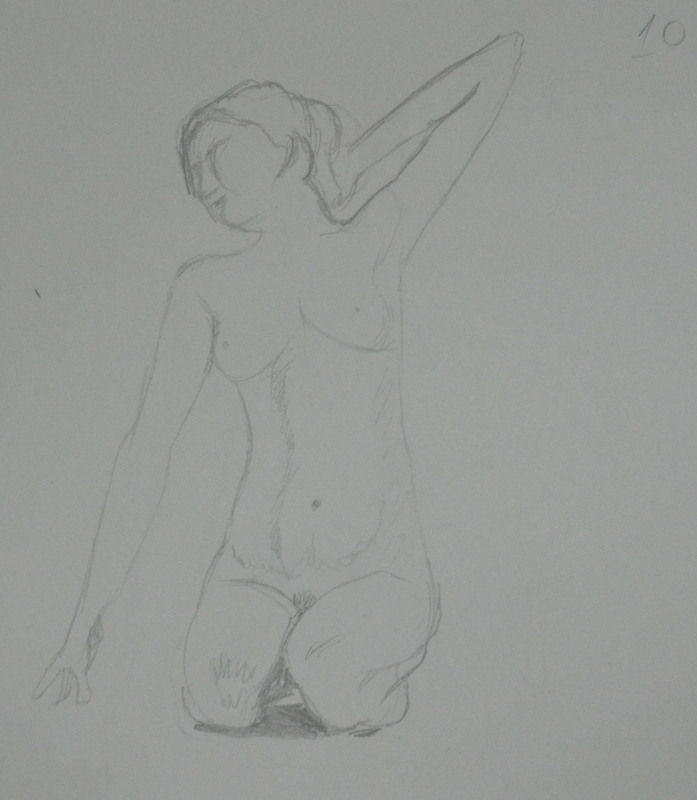 In the quick poses the sketches do seem to be out of proportion in 2 or 3 but I think this was down to excitement more than anything else, it was the first time I had done any life-drawing and I was also worried that the model (my girlfriend) would be uncomfortable so I rushed my strokes. All the sitting poses however were in proportion and measured the same from the head to the seat of the backside. I was meaning to draw the girlfriend again with this exercise but I came across two great opportunities to do two longer pose drawings on the same day. Firstly I was teaching a class of two teenagers but on this day only one turned up. The girl who turned up was dressed in her lower-high school uniform, which are quite quaint and remind me a bit of the Victorian school uniforms so I couldn’t resist drawing her. Being the best English speaker of the two we managed to keep chatting while I finished. 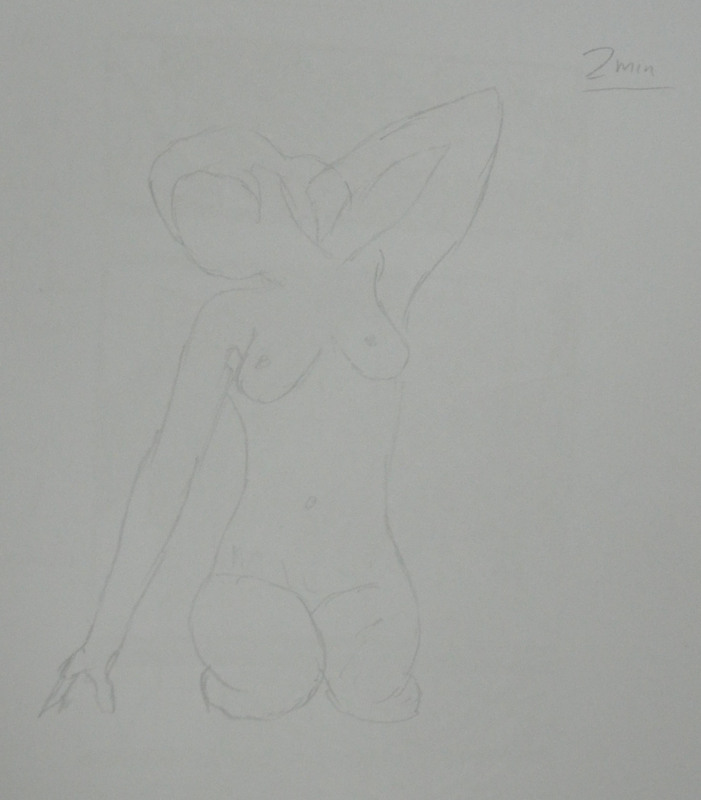 The drawing took me only about 40 minutes or so and I used the end of my Mars Lumograph pencil in front of her head and checking the measurement against the rest of her body. As with my girlfriend in the quick poses exercise her head fit into her body about 4 times to the seat. 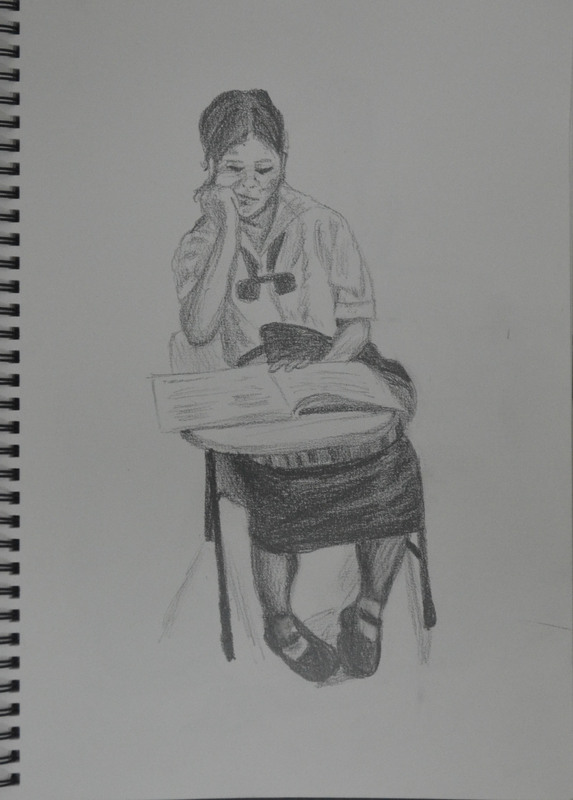 However, it wasn’t the ideal drawing for this exercise, as the clothes weren’t tight fitting and the desk and bag cover a large proportion of the girl’s body but drawing from her waist (or desk) up it gave me some good practice and my subject fit nicely on the A4 sheet. My second great opportunity came with my friend being in the dog-house and taking refuge at mine until he found somewhere else to live although this time I worked mainly from a photo as he could never stay still for long. The drawing took me spot on an hour but a large portion of the time was spent getting his mouth right. I wish I had remembered what I had learnt from the OCA video below and asked him to keep his mouth shut. Nevertheless, I am quite happy with the finished drawing. 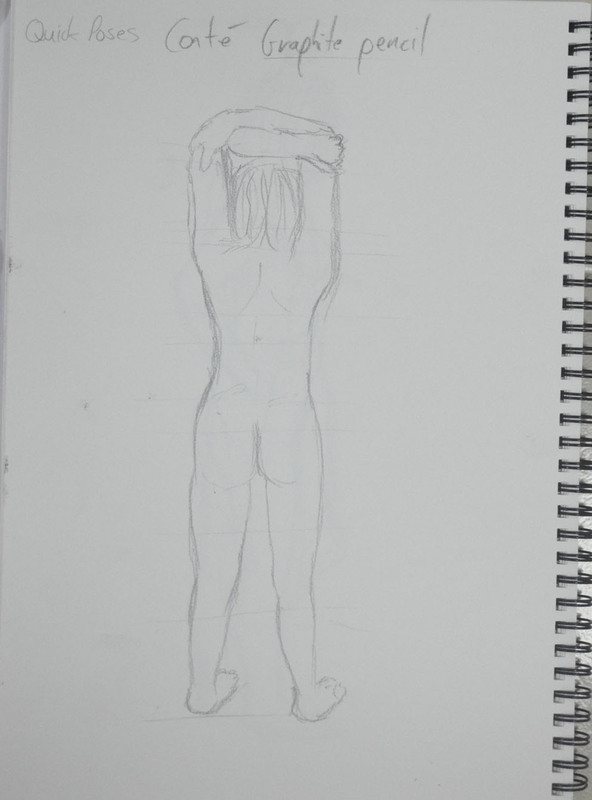 This time I drew from the waist out to the feet and then up to the head and again using my same method of measurement. Unlike the drawing of the schoolgirl above you can see more of his body shape and I could actually follow the contours of his body in the t-shirt and shorts. 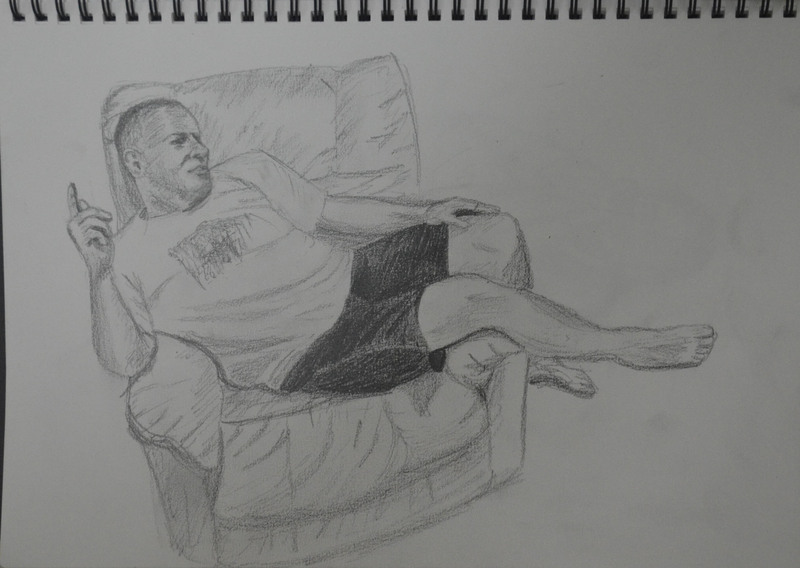 The hardest part of the drawing was his dodgy pointing finger and his open mouth which I had to resort to drawing with a 2B pencil as the 6B was just too big.